To connect your CurrentWare Clients to the CurrentWare Server over the Internet, you will need to port forward the CurrentWare traffic from your network’s router to the CurrentWare Server computer. First, you will need to set up your CurrentWare Server on a network that has a Public Static IP address (obtained from your Internet service provider). Forward the following port traffic to the IP address of your CurrentWare Server computer. This is a sample picture of a Linksys router’s port forwarding configuration screen. If you are not using Linksys, the menu items and labels may vary. Click on "Connections" and under the section "Remote server connections", check the option "Allow remote connections to this server"
Right click on the option "TCP/IP" and select "Properties"
Install the CurrentWare Client by running the cwClientSetup.exe file on the Client computer. 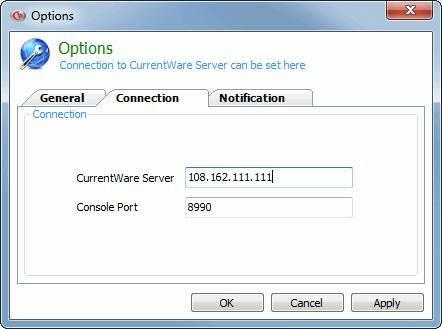 During the installation, put in the Public IP address, hostname or DDNS of the CurrentWare Server’s Network. Having issue connecting the external CurrentWare clients?